Archbishop Jean Mbarga of Yaoundé says the Catholic Church can play a big role in helping Cameroonians affected by the secessionist uprising in Cameroon’s English-speaking regions, as well as the millions of Cameroonians affected by poverty and other hardships. During an event to launch a fund-raising to benefit the poor and destitute of Cameroon, the archbishop talked about charity as a major part of the Christian faith, and the role the Church’s aid agency Caritas has to play. 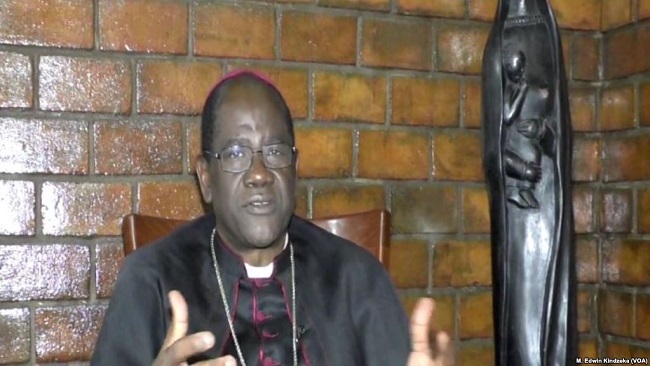 “The Caritas Foundation-Cameroon is the voice of the bishops at the service of the poor,” Mbarga told journalists during a press conference in Yaoundé on Nov. 12. “The bishops have decided to not remain indifferent, vis-à-vis the growth of misery. That is why we put in place the Caritas Foundation. That means that henceforth, we have a reliable instrument to sensitize the population on the need for generosity, mobilize for the African hospitality and above all mobilize for Christian charity,” he said. Most of the refugees in Cameroon are fleeing internal conflicts in Chad and the Central African Republic. Mbarga said the poor and destitute require access to water and healthcare, young people need support to set up enterprises, and projects of community interest need to be carried out. “Remember that Caritas is an institution for aid and development,” the archbishop said. Of great concern to the archbishop is the ongoing Anglophone Crisis in Cameroon, where government forces have been fighting separatists in Cameroon’s English-speaking North West and South West regions for nearly two years now. Teachers’ and lawyers’ strikes in 2016 over perceived attempts by the francophone-dominated administration to destroy the Anglo-Saxon-educational and legal systems practiced in Anglophone Cameroon mutated into political demands for independence by the Anglophone minority, who make up around 20 percent of the population. Now separatists wish to establish a new country, called Ambazonia. According to the spokesman for the Cameroon military, Col. Didier Badjeck, at least 1,000 people -mostly separatist fighters – have been killed in the fighting. The military has lost 200 soldiers – exceeding the number of soldiers killed in Cameroon’s four-year war against Boko Haram. The crisis has led to the displacement of at least 437,000 people, according to the UNHCR, most of them in dire need of humanitarian assistance. In addition, 58 schools have been destroyed and 3.3 million people are in need of humanitarian assistance. “This year’s fund-raising naturally targets those in need and in emergency situations,” Mbarga said. “Last year, we were living in relative peace. This year, we are faced with very heavy humanitarian needs. How do we take part in that reconstruction work as Christians and how do we come to the help of the affected families, who have lost loved ones? How do we help in rebuilding schools and hospitals that have been burnt? All these require of us, generosity,” the archbishop said. While the Anglophone crisis has dominated the news from the country, Cameroon’s rates of poverty remain disheartening: At least 30 percent of the population lives below the poverty line and 70 percent of the country’s over 25 million people still don’t have access to potable water. The Director of Caritas Foundation Cameroon, Father Kisito Mballa Onana, said Cameroon was also suffering from a refugee crisis as a result of the fighting in the Anglophone regions. “They live under precarious conditions,” he said. Cameroon was governed under a federal system of government between 1961-1972, giving English-speakers a large degree of autonomy from the French-speaking majority. The Catholic Church has been opposed to secession, calling on the authorities to initiate an inclusive dialogue with the various stakeholders. In a May 16 letter, the bishops called for an end to the fighting. But the situation has continued to get worse. “These last days, the number of deaths and people kidnapped has continued to rise…the secessionists are gaining ground. They too are violent and kill people,” Onana told Crux.